Ivy is an incredible single mom. 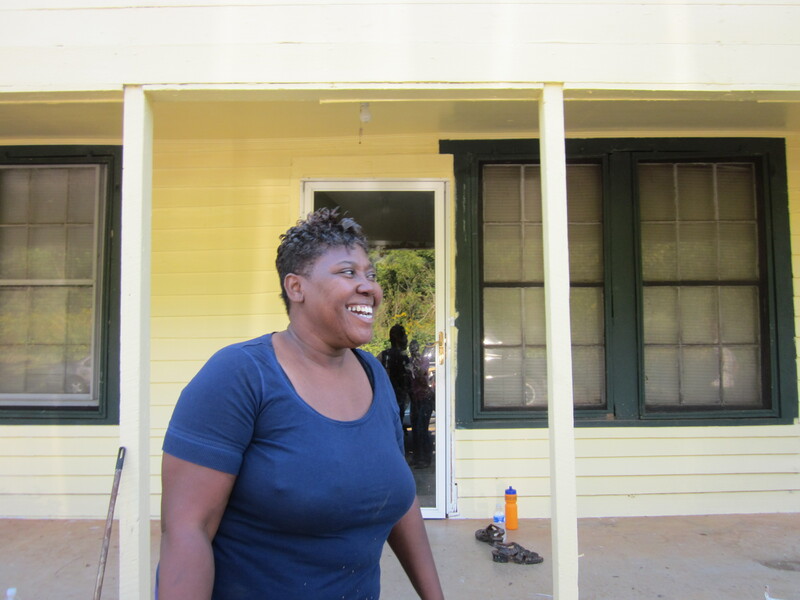 When she asked for help painting her house, Cathy Smith and I went to visit her. She showed us that the house walls and attic had no insulation at all. I remembered Millard sharing a story with me about two elderly women who froze to death inside their home in Americus one winter. Even though we live in the Deep South, it can occasionally get very cold. For those who live in older houses without insulation, this can be a very uncomfortable and even dangerous situation. So I had worried about Ivy and her daughter, Tierra. Tierra is about the same age as my own daughter, Grace. Tierra chose the new paint colors for their house, a beautiful soft yellow with some dark green trim. When Ivy told me that the inside of her house is usually close to the same temperature as the out doors, I wanted to weatherize her walls and attic, but we ran low on funds just as weather turned cold. My colleague, Stacey Goolsby, offered to write a grant proposal to Home Depot to purchase some insulation for Ivy and it was approved! So today was the day. After a week of freezing cold rain, on faith that the weather would get better, I got up before sunrise and drove 35 miles to Cordele to our closest Home Depot to be there when they opened their doors. It was very foggy and I couldn’t predict how the day would turn out. But I trudged on, hoping to be back before the volunteers would arrive. We couldn’t miss this opportunity to help Ivy and Tierra. Faith is an amazing force. Our entire Judeo-Christian tradition is based on an amazing journey of faith by a large community of people who found themselves homeless and wandering toward a promised land and a better way of life. Faith is an action. When people find themselves in a rough situation in which there is not much they can do, it is quite possible to lose hope and give up. If the Israelites had resigned themselves to failure in the wilderness, which would have been quite understandable given that they were without shelter or the knowledge of where their next meal would come from, our heritage and current experience of Christianity would be a lot different. It would have been easy for them to curl up and just die. But amazingly, that is not what happened. The Israelites had faith and while they couldn’t do a lot about their situation they did do a little. They kept traveling on their journey. They kept their dream for a new homeland alive and they kept praying, “Give us this day our daily bread.” Faith is an action, not just a hope of what cannot be seen. Ivy Nunn is the embodiment of faith in action. When I first met her, she showed me that as she could afford it, she had been purchasing one or two boards of siding at a time, in the hope that one day she could make a better home for her daughter. She couldn’t do a lot about her situation but little by little, she did what she could. Many Christians are unaware of how the Israelites decided to celebrate and remember both the wandering in the dessert and their rescue by God and their deliverance to a homeland. They have a "Festival of Sukkot," which literally translates into “Festival of the Booth,” so the Jewish celebration is often called The Festival of Shelter. On the fifteenth day of this seventh month is the Festival of Sukkot, seven days for the L-RD. I think it would be good for Christians everywhere to join the Jewish tradition of The Festival of Shelter. Jesus was keenly aware of the rescue from the wilderness narrative in our sacred scriptures and his Jewish traditon of celebrating The Festival of Shelter. I believe the Exodus narrative probably formed his thinking and helped him explain what he called The Kingdom of God. God’s Kingdom wasn’t to be established by a violent military takeover as some around him had hoped. It was to be established by a movement of his followers; one kind act at a time. This is why Jesus could say, “The Kingdom of God is at hand." Right here, right now. He taught it is possible to experience it through love of God and love of neighbor. Insulating one house doesn’t solve all the problems in the world. It certainly will not solve every struggle Ivy and Tierra will experience in their lives. But if I understand Jesus correctly, God’s Kingdom is our Kingdom to experience. Martin Luther King, Jr. called the Kingdom of God "A Beloved Community." Ivy’s house is our house and tonight it will be a little warmer thanks to some wonderful Fuller Center volunteers and because Ivy truly is a woman of faith in action. 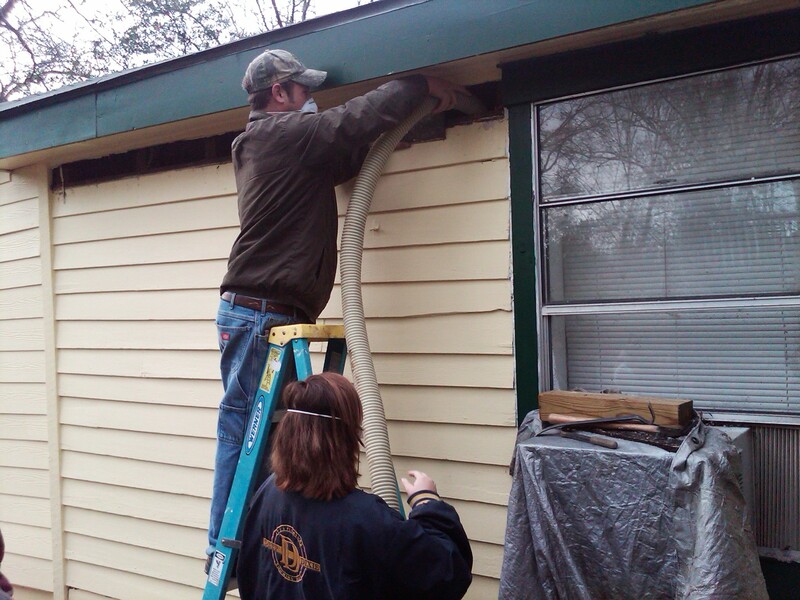 Thanks for having a heart for the poor and serving through home repairs! As a fellow home repairs ministry we wish you the best.